Enter the force in either of the next two fields and get it converted instantly, from Newtons to Pounds force (N to Lbf), or the opposite, from Pounds force to Newtons (Lbf to N). The pounds force (symbolized lbf or lb-f) is a unit of force according to the Imperial and US customary systems of units. Often it is called just pounds, especially when the surrounding context implies a quantity of force. 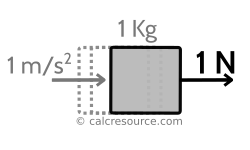 Even though pound-force is closely related to the respective pound, which is a unit of mass, it is considered best practice to use the pound-force name. 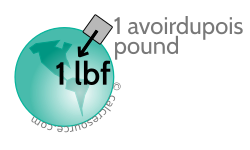 Pound force is defined as the force of gravity on the earth's surface upon a mass equal to one avoirdupois pound. Its equivalence to the respective metric unit, the Newton [N] is:1 lbf = 4.4482216152605 N . The above definition depends on the earth's gravitational acceleration g, which varies from place to place, but is conventionally averaged as g ≈ 32.1740 ft/s2 , at sea level. A quick example how to use the above table is given here. Assuming, you need to find the relationship between Kilonewtons (KN) and pounds force (lbf), the following equation is derived from the table: 1 KN = 222.81 lbf. where F the force, m the mass and a the acceleration. A quick guide how to use the above table is given here. Assuming, you need to find the relationship between Meganewtons (MN) and Newtons (N), the following equation is derived from the table: 1MN = 106 N.
Do you find it difficult to distinguish between mass and weight? In everyday practice these two quantities are sometimes confused as identical, and most of times, we are used to overcome it, without severe implications. But, when the time comes to perform a calculation, employing either weights or masses, or both of them, it is important to distinguish between the two and to correlate one with the other. Mass is a fundamental property of matter, that practically describes the resistance of an object to change its current rate of movement. The more mass an object has, the harder it should be to make it accelerate, or turn, or force it to stop, if it is already moving. Also, the mass describes how strongly an object can pull other objects through gravity and similarly, how strongly it is affected by other objects gravitational fields. A given object has the same mass, either on Earth's surface, or on Mars or wherever it is placed in the universe (theory of relativity aside). Weight is a force. It is the force that Earth's gravity applies to an object with a given mass. Therefore, it is a quantity related to the mass, but it is also related to gravitational field around the object, which varies from one location to another. Therefore, a given object would have different weights if placed at sea level or on top of a mountain. Most scales actually measure weight, instead of mass. As a result, a bag of apples, weighed by the same scale, will be slightly heavier at sea level, where the gravity is stronger, compared to a ski resort in Alps, where gravity is weaker, potentially saving you a penny or two. That is unless, the store owner, takes measures and calibrates the scale appropriately for his altitude. This example demonstrates that the weight of an object is not a universal property, even though we are used to treat it so, for convenience in our everyday transactions.